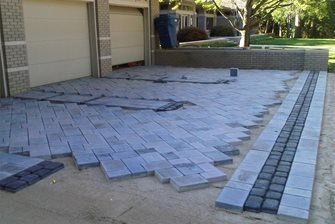 The home's existing concrete walkway was demolished and replaced with dimensional cut bluestone complete with an ice melt system. 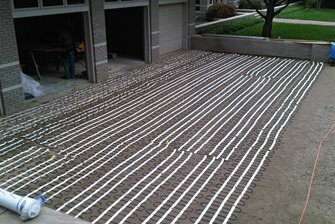 The electric ice melt system being installed beneath the driveway pavers. 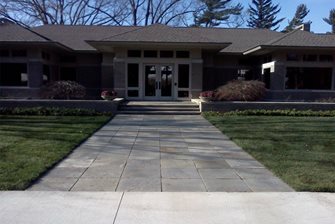 Two types of Unilock pavers were used to echo the home's brickwork pattern. Pennsylvania fieldstone boulders were used to retain the bluff that faces the lake. A view of the back paver patio in fall. A dry streambed of Mexican beach pebbles was created in the front courtyard. A drainage lake helps move excess water to the storm drains. 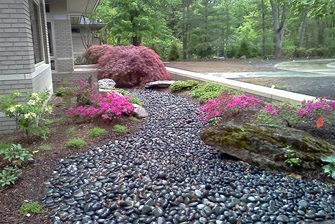 The upper patio garden features boulders, pebbles, moss and an existing Japanese maple. The view up from the lake and dock was important to the designer. 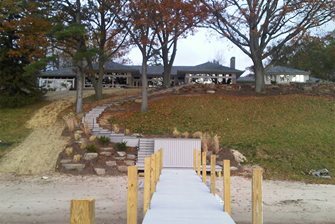 The view down onto the lake, dock and pergola, which was constructed on top of a storage area made of composite materials. 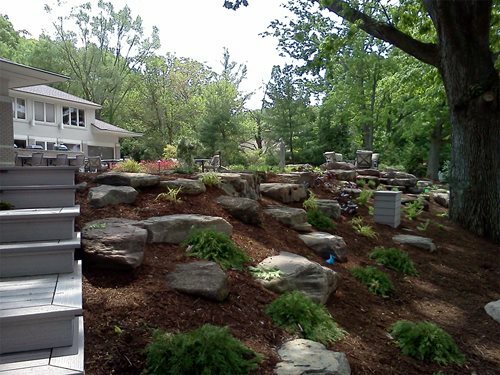 When Chris Major, landscape designer and project manager for Blue Ridge Landscaping, came on the scene this home's landscaping was a blank slate. 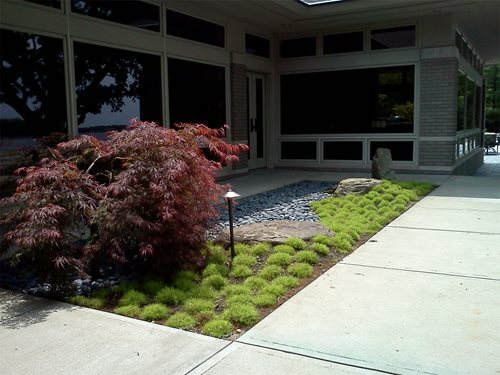 There were a few existing Japanese maples, beds of English ivy, lots of turf grass and dated concrete hardscaping. 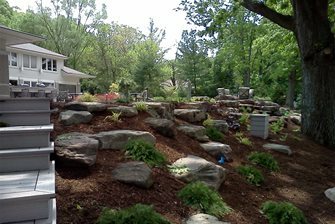 The homeowners were in the process of remodeling the twenty year old home and wanted to update the landscaping at the same time. They found Major and his crew when checking out swimming pools built by a company they were considering. "The wife had asked the pool builder who did the landscaping on a project they visited, so the pool company referred her to us," explains Major. 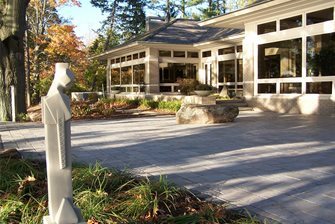 This began a process of constant collaboration between Blue Ridge and the homeowners that led to a completely renovated landscape. Major gathered inspiration for this design from two main sources. First, was the home's architecture itself. "The owners wanted clean lines that would echo the prairie-style, bringing out the home's grandeur in a subtle way," he says. Second, was a trip that the homeowners had taken to Kyoto, Japan. There they had come to appreciate the balance and symbolism found in Asian gardens. "Since I have not been lucky enough to travel there, I hit the library and internet to research Kyoto's gardens," continues Major. He quickly realized that the Asian landscape style was a perfect complement to the home's broad overhanging eaves, horizontal bands of windows and existing courtyards. Landscaping SolutionsThe Blue Ridge Landscaping crew faced many challenges on this project. The first was demolishing the concrete walkways. "This home was built well, maybe even overbuilt," says Major. "Because the concrete was so thick, demo was hard work." Once the concrete was gone the ground was prepped for dimensional cut bluestone and Unilock pavers. 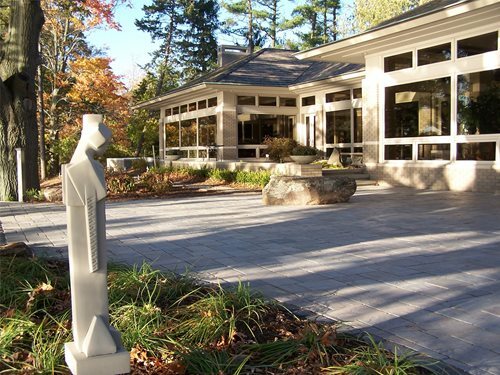 Major chose pavers for their aesthetic appeal and because they have more forgiveness than concrete in a climate with frequent freeze and thaw cycles. Additionally, an electrician helped coordinate where wiring sleeves should be run beneath the hardscape for lighting and outdoor speakers. This home's proximity to Lake Michigan means that it sits within a unique microclimate. The large lake acts much like the ocean, keeping temperatures warmer in the winter and cooler in the summer. "You'll have more success wintering over plants here than in other parts of Michigan," says Major. But this does not mean that winters are mild, snow and ice are still common. The main factor about winter here is the harsh winds that come off the lake. The wind factor had to be considered when selecting materials and plants for this site. 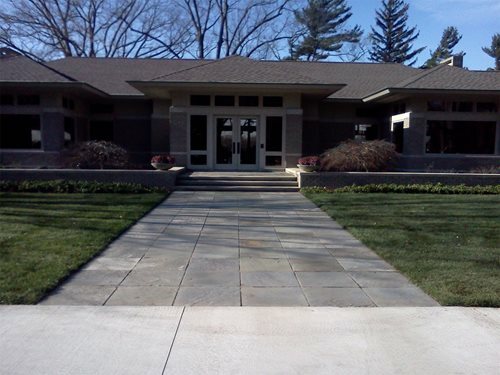 This was no ordinary paver installation. 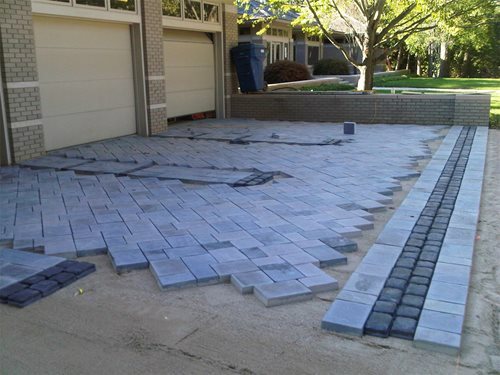 "Part way into the project the owners decided they wanted an ice melt system installed beneath the entry walk and a portion of the driveway," Major recalls. 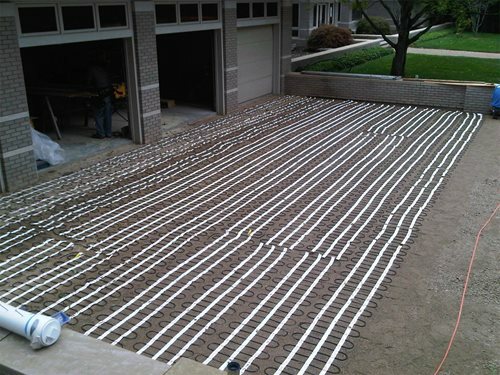 This type of system is similar to radiant heating found beneath interior flooring. A sensor triggers electric coils to produce heat which then radiates up through the pavers and melts any snow or ice that is present. A compacted base of crushed aggregate was laid as usual, followed by a layer of sand. Next the electric coils were carefully placed as not to touch one another. Then a second layer of sand was placed over the coils. Finally, the pavers were set and compacted. While an electrician did inspect the mats before and after installation, the true test would be when snow fell and the system was turned on. Thankfully when winter arrived, and the homeowners turned on the system, it served its purpose and melted the ice and snow. 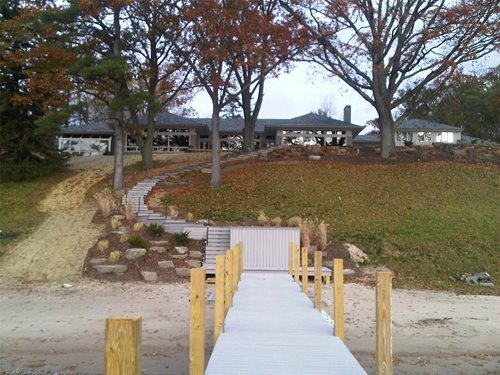 Another challenge that Major and his team faced on this project was retaining the bluff which faces the lake. "We needed to stop erosion caused by water and strong winds in an aesthetically pleasing fashion," he says. At first, Blue Ridge considered constructing a wall, but ultimately they settled on using Pennsylvania fieldstone boulders to support the hillside. The same boulders were used throughout the landscape. Major likes them because they are aged and often have moss and lichens present. "We wanted the landscape to feel old and mature, the boulders helped us achieve that," he states. This approach to retaining the hillside required less engineering and weight, plus it provides a very nice view from the dock and boat. When construction began, an arborist was brought in to assess the existing trees. Blue Ridge crews took great care to ensure the safety of the mature oak trees growing on the bluff and strove to disturb them as little as possible. 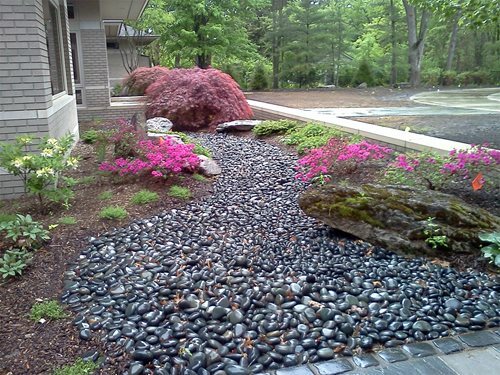 Stones are often used to symbolize water in Japanese gardens. With this in mind, Major designed a dry streambed. 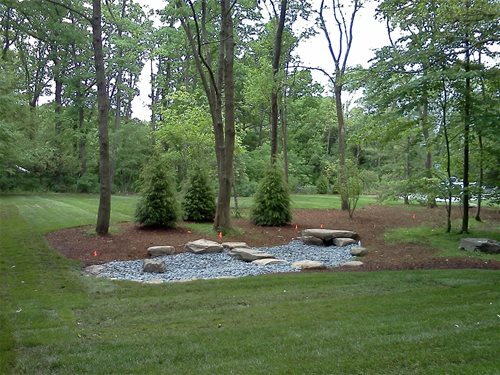 The meandering streambed, intended to give the eye a place to rest by breaking up the straight lines of the home, is located in the front courtyard. First, the existing English ivy was removed and the ground was rototilled. After all the ivy was gone boulders were placed. "We arranged the boulders in an unorthodox fashion," explains Major, "some are up on end and others jut out at interesting angles." Next, filter fabric was laid in order to keep weeds from growing up through the streambed. Then a few layers of smooth Mexican beach pebbles were added and groundcover was planted as the finishing touch. "This was an enjoyable part of the project - creating balance and flow as well as representing mountainscapes and tree groves in miniature," says Major. *Note: When we planted the running bamboo we also installed a 30" rhizome barrier to contain the shoots. This theme of using stones to represent water was carried into other parts of the landscape. A drainage lake with a similar Asian style was created in a spot where water gathers. This feature serves an important function. Excess water from irrigation and storms gathers in the small lake and flows to the storm drains. 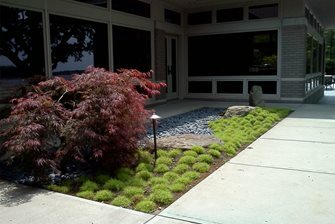 There's also a small area on the upper patio featuring a similar combination of boulders, pebbles and Asian plantings. It is a beautiful focal point that can be viewed from inside the house. Plant Selection"My plant choices were made based on wanting to achieve a look that was natural, yet balanced and Asian-inspired," says Major. 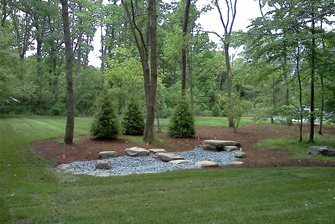 Wherever possible, mature trees and shrubs were installed to enhance the established-look that Blue Ridge and the homeowners desired. 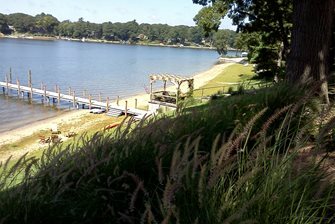 Groundcovers and small perennials, including ornamental grasses, were installed to form dramatic sweeps that would be visible from the lake. Running bamboo was planted near the private hot-tub area off the master bedroom. "We don't often use bamboo," states Major, "but in this case it was appropriate for the Asian theme." During the first winter, the weight of ice and snow caused the 7-foot-tall shoots to bend nearly all the way to the ground. But to Major's liking, most sprung back up with the arrival of spring. Major says the key to success on this project was teamwork. 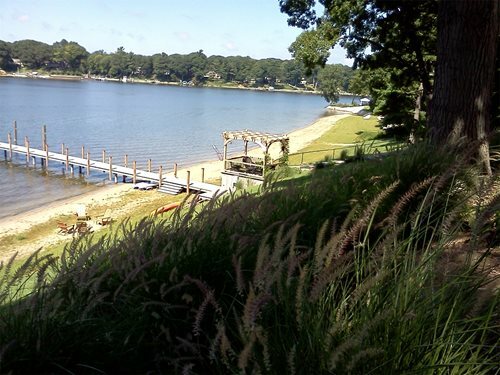 Throughout the installation Blue Ridge crews collaborated closely with the homeowners, pool contractor, irrigation contractor, woodworkers and an electrician. "By drawing on our varied experiences we were able to create a truly special place for the homeowners," he says. All-in-all this project was a great victory for everyone involved.